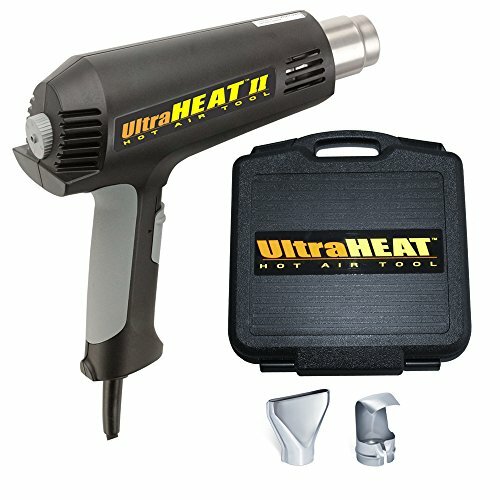 The Steinel 34104 SV 803 K kit includes the SV 803 heat gun, which emits airstreams at temperatures ranging from 140 to 1,050 degrees F. The gun’s temperature setting can be varied continuously at the low and high airflow stages, and is fixed at 140 degrees F at the cool air stage. Similar in shape to a hair dryer, the gun is lightweight and balanced to reduce fatigue. The heating element is reinforced to extend coil life and has a ceramic disk to provide even heat. A thermal fuse in the heating element protects against overheating. The gun’s circuitry is encased in injection-molded plastic to prevent disconnection, and the fully enclosed slide switch and secured power cord help ensure reliability. The kit includes a spreader nozzle, a reflector nozzle, and a carrying case. It is suitable for applications such as shaping plastics, repairing leather and vinyl, and applying shrink tubing.